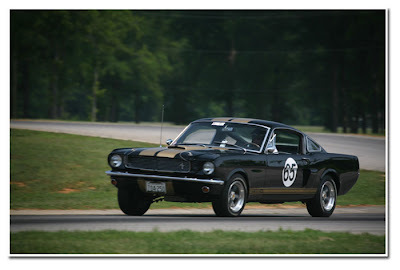 Virginia Classic Mustang Blog: 1966 GT350H "Clone"
We really want to thank Joe Boland for sending these images and information about his 1965 (66) GT350H "Clone." 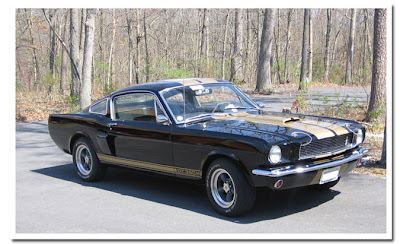 Joe really enjoys his Mustang, and it has never been on a trailer. 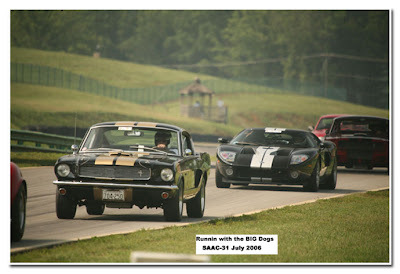 Joe attended SAAC (Shelby American Automobile Club) 31 at Virginia International Speedway a few years ago and had a blast running around that great track! Most of the pictures are from this event. 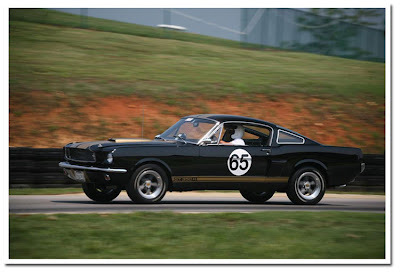 It's always great to see, I should say "hear," Joe pull into our lot here at Virginia Classic Mustang. We usually know who it is before we even look! Made from Red on Red 1965 Mustang 2+2, 5F09Cxxxxxx. Owners: Joe & Barbara Boland. 1973 Ford 302 V-8, Approx. 240-250HP (194.2 RWHP 9/2006). Re-built 1973 Ford C-4 3-Speed Auto. Transmission with Shift Kit. 1965 Shelby Style Driveshaft Safety Loop. Shelby Style Export Brace & Monte Carlo Bar. New 14-Circuit Painless Wiring Harness with 4-Way Emergency Flashers, New Auto Meter Gauges mounted in 1966 Instrument Panel. Kenwood AM/FM/CD Stereo with 6-Speakers (Stereo Dash unit, 2) 5 ½” Pioneer Kick Panel . Grab-A-Trak 620# 1” Lowering Front Coil Springs with Polyurethane Insulators, new Spring Perches & KYB Gas-Adjust Shocks. Grab-A-Trak 4 1’2 Leaf mid-eye 1” Lowering Rear Springs & Polyurethane Shackle Kit, Cobra Automotive Heavy Duty Spring Plates with integral Traction Bar Brackets, Heavy Duty ½” U-Bolts, KYB Gas-Adjust Shocks, Traction Master Traction Bars & SMR Sub Frame Connectors. American Racing 15”x7” Torq Thrust-D Wheels with 215/60R15 Tires.